The Middle School holds a unique place in the Ermitage landscape. Much can be said about its strong academics, its wonderful faculty, its always excited pre-adolescents… But it is much more. It is, in fact, a journey between two very different realms of learning. In their own words, students see themselves as engaged in a journey from “the cocoon” of Lower School to the “brink of adulthood” in Upper School. “Finding your voice. Finding your way.” That is the introductory line for our section and it communicates well what our students are trying to do: create and speak with a new voice, with new confidence, and on a new path. Ermitage’s Middle School is a great place for students. It is a place where they can succeed academically in a rigorous bilingual program, trained in the traditional subjects such as language arts, history, geography, science and math. Within the classroom walls, our students are encouraged by their teachers to strive for academic excellence. It is also a place where they can be challenged to develop a greater sense of themselves on a wider international scale. Outside our walls, another type of learning occurs. Ermitage offers many unique opportunities for students to engage in the world around them from service projects, to field trips, to foreign exchange programs. 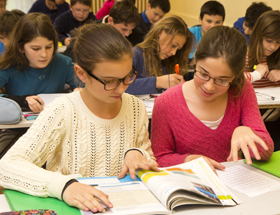 Our Middle School students are encouraged to go beyond their limits and beyond their borders. We constantly remind our students that “more is in [them]” than they may realize. Kurt Hahn, founder of Round Square, used this phrase to push students to achieve their best. I am privileged to be able to accompany our students on this journey, where students will not only re-enforce their innate qualities as inquirers and thinkers, but will also be encouraged to become communicators and risk-takers. Every day our students become more and more reflective and responsible actors in their own learning experience.